I’m really hyped up, excited but at the same time scared running a Marathon. I never thought I could do that at the age of 19. I don’t know if I will be able to finish it. I just wanted to run. That’s all that matters. Before and during the race day, I’ve been hearing—and I knew people were talking behind my back—that I won’t be able to finish my run in Condura Skyway Marathon. Some said that I would be able to finish it beyond my target time of sub 8 or 7 hours or that my knee injury will be back with a vengeance. Nevertheless, I even finished the course the natural way—barefoot, strong and without injuries. I’ve been preparing my knees for this run. 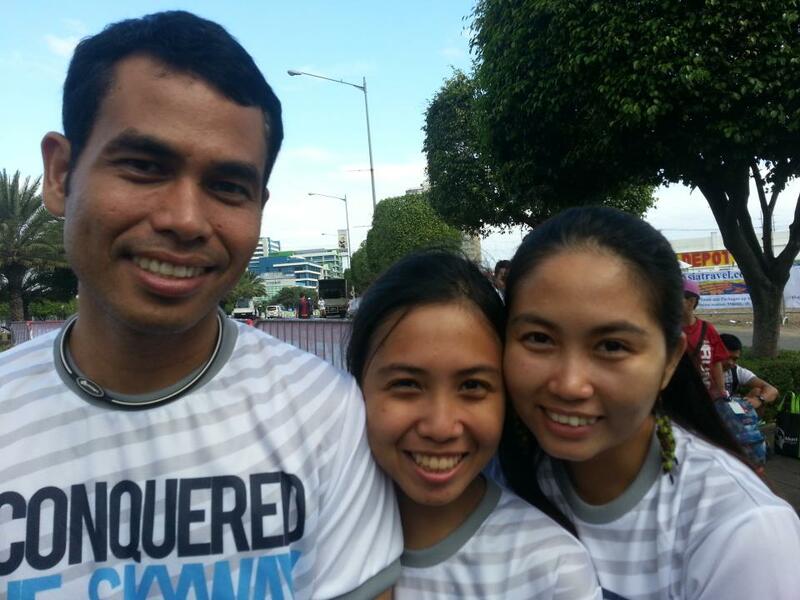 Last Sunday, with God’s guidance and strength, I ran my first Full Marathon and my first official race for 2013. With little preparation because I was busy in school and at home, I ran what seems like a very challenging first 42km run for me. I had all the reasons why I wanted to stop and not go on anymore. I’m very sleepy, I got wounded on the skyway—because of drowsiness, my shoes feels really heavy already, I’m tired, I’m bored, my muscles hurt, etc. but because I’m running for what I believe in, I went on. As an advocate of Barefoot Running, I really wanted to run my first Full Marathon barefoot but my running friends and buddies disagreed and even tagged me as Suicidal Princess. Ha-ha! Well that’s quite true. My journey as a runner has been quite a risk. 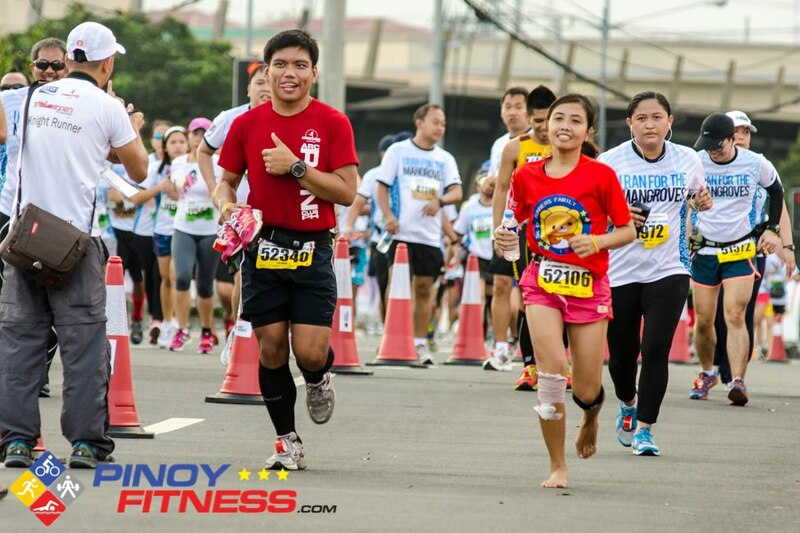 I didn’t run barefoot the whole course but did so at the last few kilometers. That way, I can still advocate the natural way of running. People looked at me and wondered why I do it. I did it because I believe in what is natural and it makes me run faster because I feel lighter. It’s actually my first time running at the skyway because I only became active in joining fun runs summer of 2012. I enjoyed it so much because I wasn’t alone in this challenge. 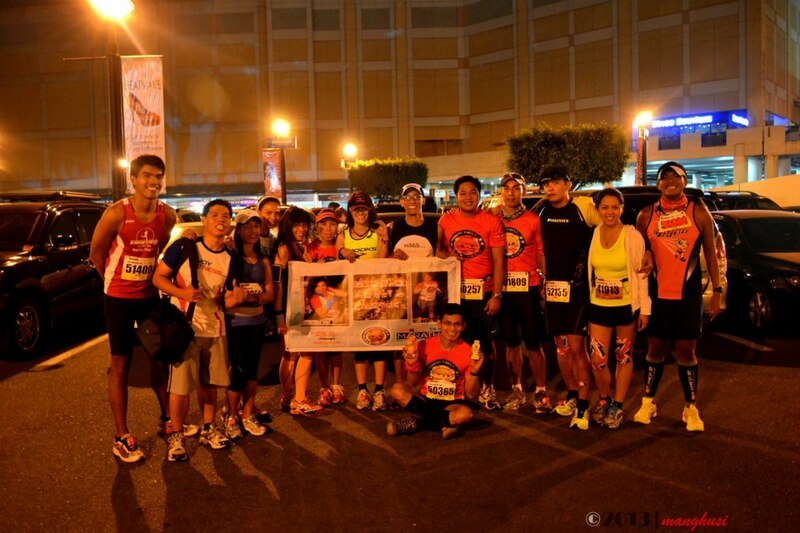 My group, OK-OK Runners Family along with We Love Running, Team Titans, ANR Ayala Triads and Barefoot Running Philippines were there running along the route pushing and encouraging me to a strong finish. Along the route, I gave my best and I was able to beat my target times on the 5th, 10th and 21st km mark, though I had to slow down a bit after the 28th kilometer mark because I wanted to enjoy my 1st time experience running the skyway. I ran with different buddies along the route but thanks to my two “mamaw” ultramarathoner friends, Machy and kuya Allan, I was able to enjoy my 1st full marathon. 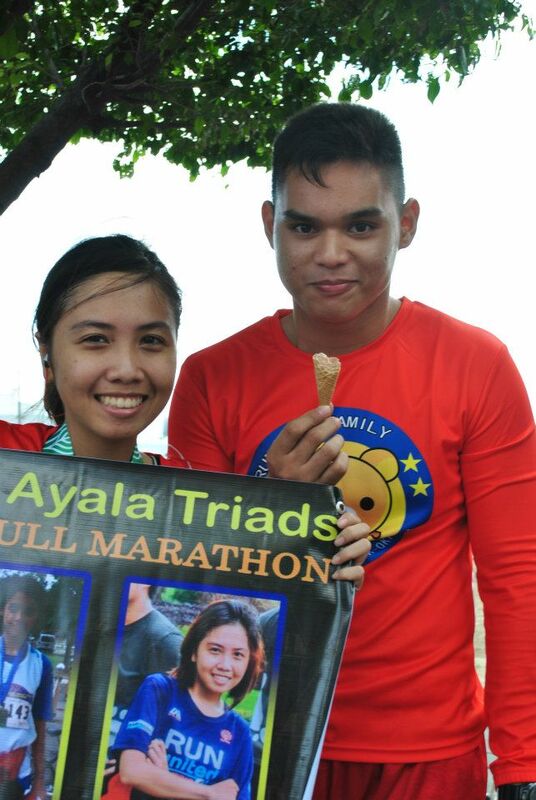 Of course, at the finish line, OK-OK Runners and Ayala Triads were there waiting for me. Oh, what a sight to see! Afterwards, a great bonding capped off our eventful day as OK-OK Runners celebrated our success with a sumptuous breakfast at Adobo Connection. I just wanted to say that, because of the continued support from my family, friends and running groups, I was able to go this far. All those trainings and lsd’s with them paid off pretty well. I would definitely want to do that again! Next stop, my 1st Ultramarathon! I have only been starting to run through long distance races and fun runs barefooted this year 2012. It’s just been a few months and I’m still new to this, but apparently, I felt as if I’ve been running barefoot my entire life. A little background about me first will be good to know at this point. I am an artist, performer, a sports enthusiast and like many others, a regular kid of the neighborhood. I hadn’t thought of actually making a really big career out of my indulgent hobbies. I do anything from crocheting to writing, from acting to dancing, from playing a lot of sports like volleyball, martial arts, badminton, etc. to being a varsity player in basketball, table tennis and long jump. Name it and I’d tell you something about it. However my best pick for a favorite sport is Running. 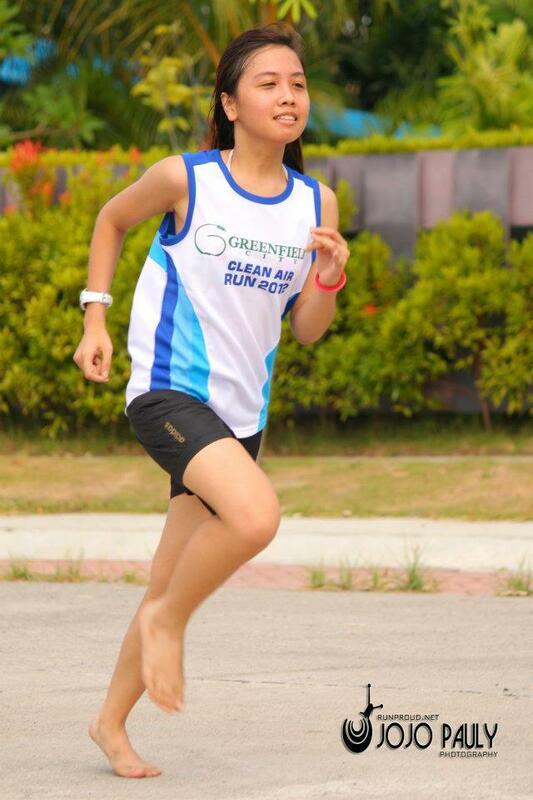 I’ve been running since elementary in school competitions like relays, 20-500m dash and obstacle relays. During PE classes in elementary, I’ve always had either the highest score or is one of the highest scorers in my class in standing long jump with my personal record of almost 3 meters. Though I’ve stopped a long time because of personal problems, I went back to running when I was introduced to running long jump during my high school years. I discovered that with my PR in standing long jump, I could take it to the next level with long jumping. I almost snatched the gold during my first official competition for long jump in Dubai, UAE with a supposedly record of almost 4 meters but I landed flat on my back from a wrong air thrust and a wrong form. Too soon to jump caused me to give up that medal. Though It’s just the beginning, I’m going to be better at it. When I went back to the Philippines, I still played in a varsity during my last year in high school but when I graduated and went on to college, I focused on my academics but enjoyed my Physical Education classes the most. I ran my first official 5-kilometer race in the 8th Animo Run that’s required for Freshman students. On the day of the race, I haven’t had enough training and halfway through the race I realized I was wearing ankle weights. It didn’t stop me though, in aiming to finish the race with my normal pace. I finished the race with a time between 25 and 26 minutes and I haven’t really thought about keeping track of it then. I felt extremely lightweight after the race and felt like running more mileage. 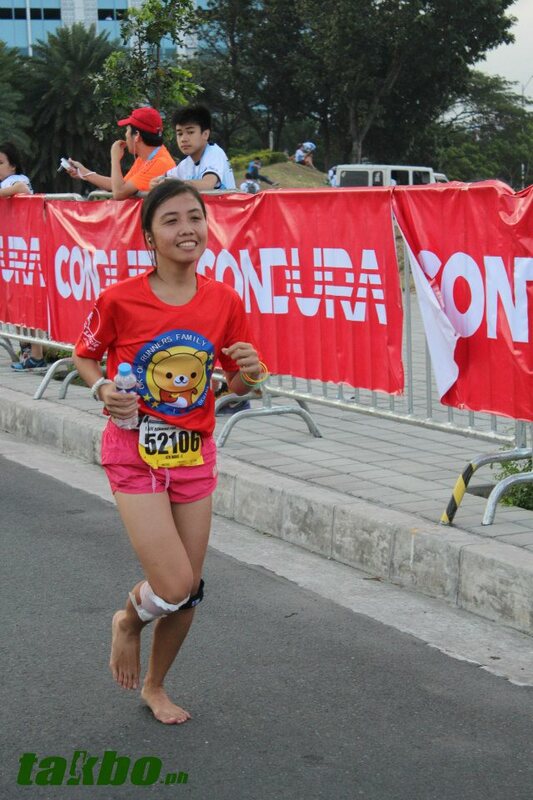 That was my first Long Distance Fun Run and at that time I still wear rubber shoes. I stopped running for a long time after that but gained enthusiasm again after 2 years. 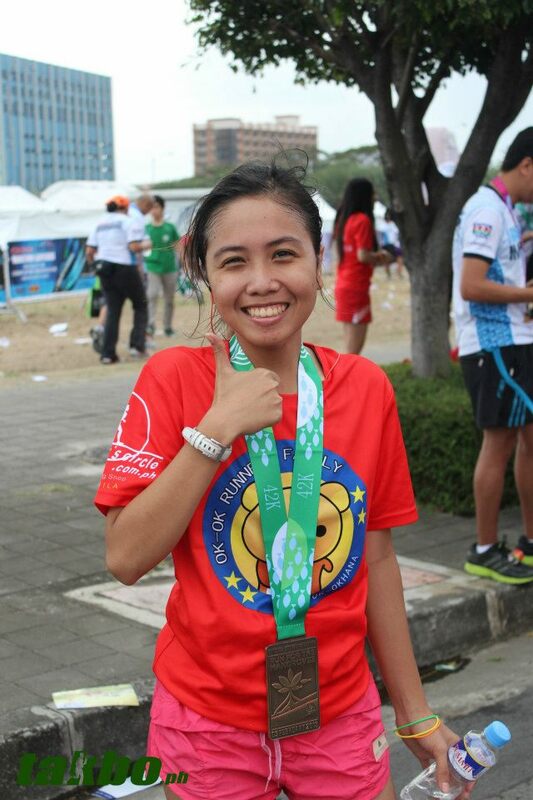 I ran my 1st run in 2 years at Hyundai Run held last April 29, 2012. I got registered in 10-kilometer. That was my first 10 kilometer run. I started the race wearing my shoes actually, but in less that 2 kilometers, my feet hurt so much that I started to go barefoot at a much slower pace, because it’s my first time. Alas, I endured the pain much easier than I thought. I actually felt great, relieved, accomplished and fulfilled after running barefooted. I felt much lighter, thus less tired. I felt like I’m one with the earth, but less gravity. Nothing can even compare to the feeling I had running bare in long distances. I’ve never ran barefoot outside before, as a kid, because I had an overly protective parents. And now that I’ve grown up to be a fine young lady, I am happy that I can run freely as I please. 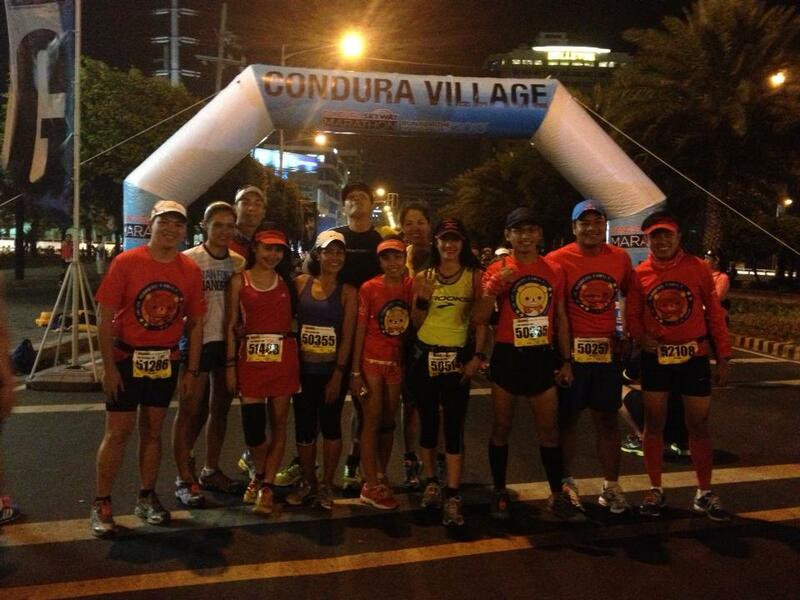 After that, I’ve become acquainted with Barefoot Running Philippines and got involved in the running community. I’m no longer a lone runner and I have had a lot of inspirations and people to support me in running. Back to running barefoot in races and training, YES, it hurts at first and even during your races it will. In running barefoot, once you step on the ground with your bare feet, you have to be ready to face the challenge. You have accepted all that’s there to face what’s up ahead. It’s a matter of the mind. It’s a challenge to stay positive and developing optimism and tolerance to pain. Reward is just there around the corner. With enough training and experience, you’d be surprised on how far you could actually go. Well of course, you wouldn’t really be able to avoid the pain and injury but you could always face it willingly. Lo and behold, running bare will cause you blisters, wounds and all other injuries just like running with shoes. However, the feeling of fulfillment and unrivaled joy is reached after completing another challenge. Humans are naturally born bare, we are designed to run free and can tolerate running long distances. On the down side, more buildings, road constructions and pollution causes our body to change and adapt to the environment, putting us at a disadvantage to running without protection. Life is like running on the road barefooted. You gotta be ready in all the challenges you face. The road has two surfaces, rough and smooth. You’re in for a surprise, a bumpy ride. Sometimes, you pass through the smooth road which brings you relief and joy. On the other hand, there are times when you will pass the rough road where you slow down and experience pain. That will make you stronger, no worries. It’s a cycle of pain and joy, as usual, achieving the balance of life in every way. I maybe a nobody, an amateur, having not much experience in barefoot running but I have achieved this much enlightenment in my early stages. I’m so excited to hear yours! Happy running! 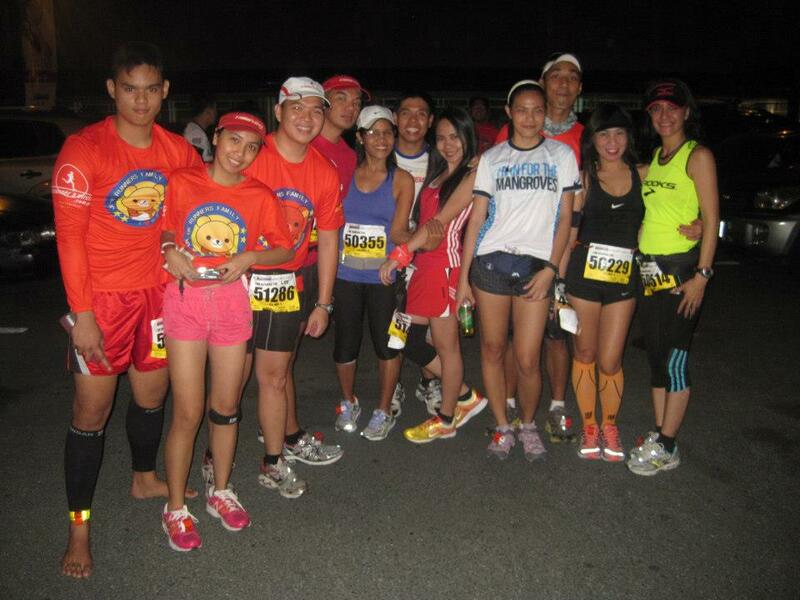 Experience the thrill and goodness of running bare. Experience the earth speaking to you, embracing you beneath your feet. Love the feeling and let it into you.